When the air remains over a homogenous area for a sufficiently longer time, it acquires the characteristics of the area. The homogenous regions can be the vast ocean surface or vast plains and plateaus. The air with distinctive characteristics in terms of temperature and humidity is called an air mass. It is a large body of air having little horizontal variation in temperature and moisture. Air masses form an integral part of the global planetary wind system. Therefore, they are associated with one or other wind belt. They extend from surface to lower stratosphere and are across thousands of kilometers. The homogenous surfaces, over which air masses form, are called the source regions. The main source regions are the high pressure belts in the sub tropics (giving rise to tropical air masses) and around the poles (the source for polar air masses). Source Region establishes heat and moisture equilibrium with the overlying air mass. When an air mass moves away from a source region, the upper level maintains the physical characteristics for a longer period. This is possible because air masses are stable with stagnant air which do not facilitate convection. Conduction and radiation in such stagnant air is not effective. Source region should be extensive with gentle, divergent air circulation (slightly at high pressure). Areas with high pressure but little pressure difference or pressure gradient are ideal source regions. There are no major source regions in the mid-latitudes as these regions are dominated by cyclonic and other disturbances. Permanently ice covered continents in the Arctic and Antarctica. Tropical air masses are warm and polar air masses are cold. The heat transfer processes that warms or cools the air takes place slowly. A cold air mass is one which is colder than the underlying surface and is associated with instability and atmospheric turbulence. A warm air mass is one which is warmer than the underlying surface and is associated with stable weather conditions. The properties of an air mass which influence the accompanying weather are vertical distribution temperature (indicating its stability and coldness or warmness) and the moisture content. The air masses carry atmospheric moisture from oceans to continents and cause precipitation over landmasses. They transport latent heat, thus removing the latitudinal heat balance. Most of the migratory atmospheric disturbances such as cyclones and storms originate at the contact zone between different air masses and the weather associated with these disturbances is determined by characteristics of the air masses involved. Broadly, the air masses are classified into polar and tropical air masses. Both the polar and the continental air masses can be either of maritime or continental types. Source regions of these air masses are the Arctic basin, northern North America, Eurasia and Antarctica. These air masses are characterized by dry, cold and stable conditions. The weather during winter is frigid, clear and stable. During summer, the weather is less stable with lesser prevalence of anticyclonic winds, warmer landmasses and lesser snow. The source region of these air masses are the oceans between 40° and 60° latitudes. These are actually those continental polar air masses which have moved over the warmer oceans, got heated up and have collected moisture. The conditions over the source regions are cool, moist and unstable. These are the regions which cannot lie stagnant for long. The weather during winters is characterized by high humidity, overcast skies and occasional fog and precipitation. During summer, the weather is clear, fair and stable. The source-regions of the air masses include tropical and sub-tropical deserts of Sahara in Africa, and of West Asia and Australia. These air masses are dry, hot and stable and do not extend beyond the source. They are dry throughout the year. 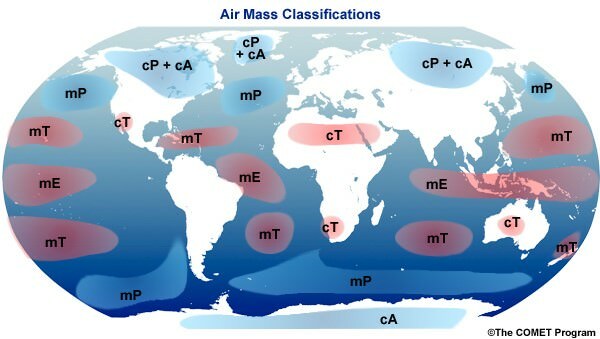 The source regions of these air masses include the oceans in tropics and sub-tropics such as Mexican Gulf, the Pacific and the Atlantic oceans. These air masses are warm, humid and unstable. The weather during winter has mild temperatures, overcast skies with fog. During summer, the weather is characterized by high temperatures, high humidity, cumulous clouds and convectional rainfall.